Yesterday I uploaded the video below to YouTube. It’s just a simple amateur recording I shot of the Fountains of Bellagio last week while I was in Las Vegas. Your video, Fountains of Bellagio: The Pink Panther Theme, may have content that is owned or licensed by EMI Music Publishing. Yup, despite all the booms and ooohs and aaahs distorting the music, YouTube nearly instantly recognized The Pink Panther Theme song playing in my video, and felt the need to send me a nasty-gram warning me about the usage of “third party content” in my video. At least this one didn’t get totally blocked like the one-minute video I uploaded a year or two ago of the contents of a Woot Bag of Crap with massively distorted audio of “The Final Countdown” playing in the background. Okay, fine. Whatever. I get that the big publishing companies want to “protect” their “intellectual property,” and it’s easy for YouTube to automatically detect things like this and take action. What I don’t get is why when someone uploads an exact copy one of my videos that’s on YouTube, YouTube does absolutely nothing. I shot the video below of a crazy electrical installation about a year ago. After I uploaded it to YouTube and posted it to Seattle Bubble, it took off, rapidly racking up hundreds of thousands of views. Shortly after it became popular on YouTube, some user downloaded it and uploaded it to Break.com as their own. Then, other users started uploading copies to YouTube. 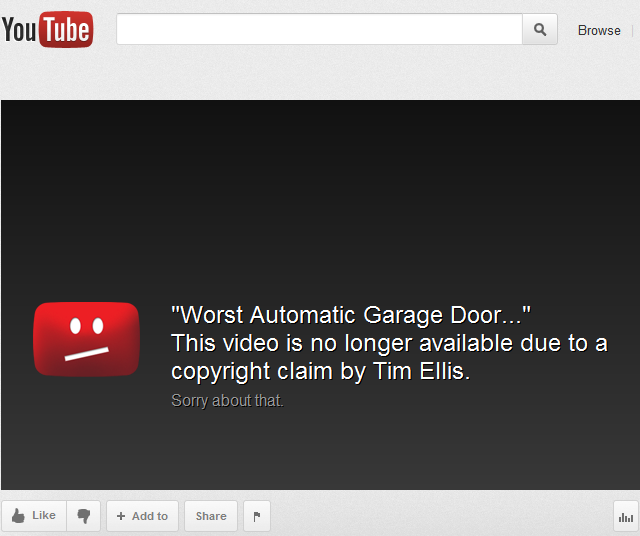 Did I learn about this via an automated message from YouTube about my video’s copyright being violated? Nope. I only found out because friends pointed out that my video was embedded on various websites, and when I clicked through to YouTube from those sites I discovered that my video had been uploaded by another user. To its credit, YouTube does react quickly when you use their Copyright Infringement Notification form to report this sort of abuse, usually taking down the offending video the same day. However, it’s still quite annoying that I’ve had to personally hunt down copies of my video that have been uploaded by other users (seven other users, so far) and manually fill out that form, despite the fact that YouTube obviously has technology capable of automatically detecting things like this. They can put links in the video space. Why wouldn’t they put a link to the original content on the removed video when a user like myself explicitly tells them where the original content is? If YouTube really wants users to upload original content, why wouldn’t they use their existing tools to provide better copyright protection for independent original content, instead of intentionally turning a blind eye to infringement that they are easily capable of automatically detecting? I can only conclude that YouTube doesn’t care about original indie content.